Save this html file to your desktop and open it in a browser. It will automatically generate a calendar of Don't Starves moon cycles going out to day 200. 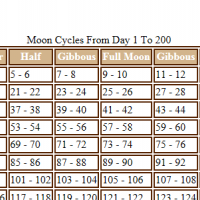 Input whatever day you want moon cycles calculated out to. I don't actually care if you put the file on your desktop or not, just put it somewhere that you can find it and open it. Pigs will turn into werepigs on a full moon. Werepigs are very bad piggies and will likely attack you and kill you for no reason. This is also when woody becomes the doom incarnate of all vegetation. The latest day I tested successfully was day 50,000. It was a very long calendar and the scroll-bar thingy was very small. If you intend to not starve for longer then 50k days then you may need a longer calender. This script won't hack anything at all actually. It's not a hack, it just makes a calendar. Just go ahead and hit "run script" or open it in Firefox instead. While transformed into a werebeaver, you should refrain from eating the berry bushes you planted earlier that day. Bad Werebeaver! bad. bad. bad. You go back to the firepit and starve back into Woody right now! Leave comments if there's some functionality you would like added to this calendar. Making it was kinda fun. Thank you very much! I have such a hard time keeping track of this sort of thing, so it'll be really helpful to me. I use this and it's really handy, but I can report it no longer works on the Google Chrome browser on Windows 10; it just gives a 'web page not found' error. Had to install Firefox for it to work.